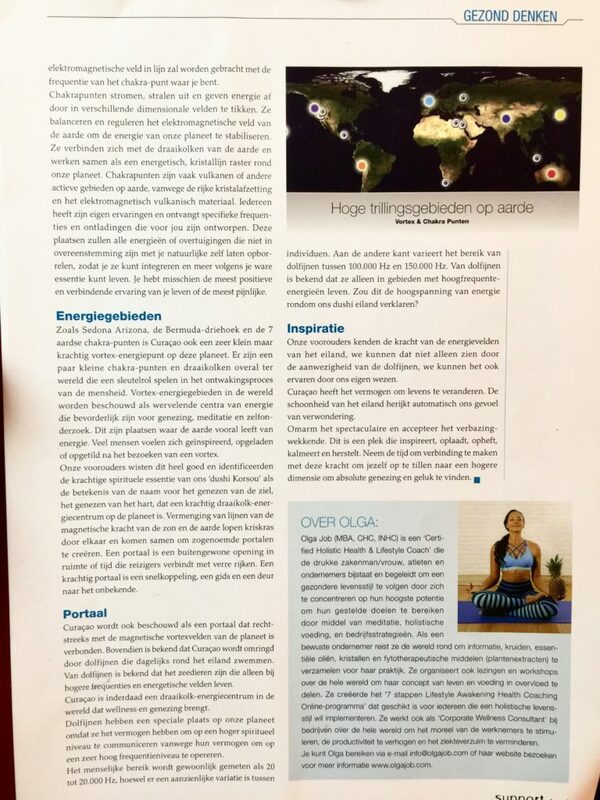 My new health magazine articles about Chakra centers and Vortex energy is finally out in the brand new SUPPORT HEALTH Dutch health magazine edition 52 (page 14 + 15). After my trip in Sedona, Phoenix 3 years ago, I became literally obsessed with studying and researching about vortex energy centers around the world and I am proud to release my research done about my beautiful native island, Curaçao! The new magazine edition is now available for purchase in all supermarkets and book stores in Aruba, Bonaire, or Curaçao. For the Netherlands, you’ll be able to order the magazine for shipment! Don’t forget to pick up your copy today!!! Here is the translation for our English speaking tribe! Did you know…that invisible energy centers in your home and work place are affecting your health every single day sometimes positively, and sometimes very destructively? Ancient cultures worldwide have always recognized the existence of special energy centers or vortexes. These vortexes occur at specific geographical locations. Earth chakras are physical locations supercharged with energy that help to keep the planet and all life on it in balance. There are more than 150 recognized earth chakras located within and on the surface the earth from deep within the sea and rocks to mountaintops and valleys. Chakra points and vortexes/vortices reflect the full spectrum of possibilities for humans to align and expand. They represent the collective, “higher self” frequencies of the body and energetic field. You will be attracted to certain locations to pick up and merge with the specific vibrations presently needed for your growth and evolution. The frequencies of these locations also live within you, even if you are on the other side of the planet! Earth chakra points are where energy spirals flows down to planet earth. The general essences of the Earth’s chakra points are to magnify the energy correlated to the body’s chakras. When you immerse yourself in these energy fields you will find that your own physical electromagnetic field will become aligned with the frequency of the chakra point you are in. Chakra points pour, radiate and give off energy by tapping into a variety of dimensional fields. They balance and regulate the electromagnetic field of Earth to stabilize our planet’s energy. They connect with Earth’s vortices, working together as an energetic, crystalline grid around our planet. Chakra points are often Volcanoes or other Earth active areas, due to the rich crystal deposits, and electromagnetic volcanic material. Everyone will have their own experiences, and receive particular frequencies and downloads designed for you. These places will bubble up any energies or beliefs that are out of alignment with your natural self so that you can integrate them and become more of your true essence. You may have the most positive and connective experience of your life or the most painful. Like Sedona Arizona, the Bermuda triangle, and the 7 Earth’s chakra points; Curaçao is also a very small yet powerful vortex energy point on the planet. There are a few minor chakra points and vortices around the world that are key players for humanity’s awakening process. Vortex energy areas in the world are thought to be swirling centers of energy that are conducive to healing, meditation and self-exploration. These are places where the earth seems especially alive with energy. Many people feel inspired, recharged or uplifted after visiting a vortex. Our ancestors knew this very well and identified the powerful spiritual essence of our dushi Korsow. Curaçao as the meaning of the name for curing the soul, curing the heart, which is a powerful vortex energy center on the planet.Mingling lines of magnetic force from the sun and Earth crisscross and join to create the openings called portals. A portal is an extraordinary opening in space or time that connects travelers to distant realms. A good portal is a shortcut, a guide, and a door into the unknown (credit: NASA). Curacao is also considered a portal via the process of magnetic reconnection and this can be viewed on the below image of how it directly links on the planet’s magnetic vortex fields. 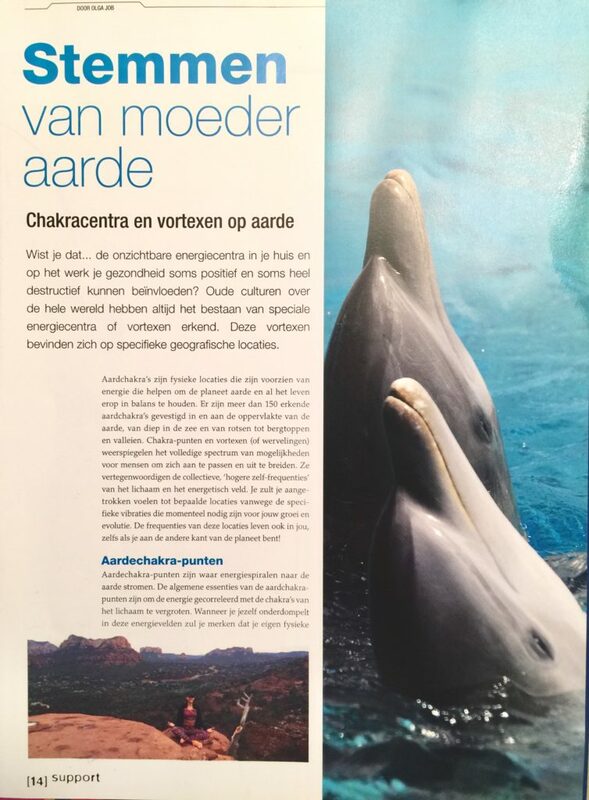 Furthermore, Curacao is known to be surrounded by Dolphins that swim around the island daily. Dolphins are known to be sea animals that only live in higher frequency and energetic fields. Curacao is indeed a vortex energy center in the world that brings wellness and healing. Dolphins have a special place on our planet as they have the ability to communicate on a higher spiritual level due to their ability to operate at a very high level of frequency. The human range is commonly given as 20 to 20,000Hz,though there is considerable variation between individuals. On the other hand, dolphins range typicallybetween 100,000 Hz to 150,000 Hz. Dolphins are known to only live in or around high level of frequency energies. Would this explain the high voltage of energy surrounding our dushi island? Our ancestors knew the power of the energy fields of the island, we can see that not only with the presence of the dolphins, and we can also experience it through of our own being. Curaçao has the ability to transform lives. The beauty of the island automatically recalibrates our sense of wonder. Embrace the spectacular. Accept the astonishing. This is a place that inspires, recharges, uplifts, soothes, restores and so much more. Take time to connect with this power to lift your self to a higher dimension to find absolute healing and happiness. Olga Job (MBA, CHC, INHC) is a Certified Holistic Health & Lifestyle Coach that works with busy professionals, athletes and entrepreneurs to support them to live a healthier lifestyle by focusing on their highest potential to manifest their goals through meditation, holistic nutrition, and business strategies. As a conscious entrepreneur, she travels the world to collect information, herbs, essential oils, crystals & plant medicine for her practice. She also organizes speaking engagements & workshops around the world to share her concept of living & eating in abundance. She created the 7 steps Lifestyle Awakening Health Coaching Online Program for anyone seeking to implement a holistic lifestyle. She also works as a Corporate Wellness Consultant with corporations worldwide to help boost employee morale, increase productivity, and decrease absenteeism.